In today's advancing world, cables can be very cumbersome and an unsightly mess in our creative spaces, often getting in the way of that "just right" place to put your mouse or meaning that we have to bunch up our gear due to length limitations. With the Yamaha MD-BT01 Bluetooth Wireless Midi Interface this is now a thing of the past! The built in bluetooth technology allows you to connect any Yamaha MIDI enabled instrument to your Mac or iOS device quickly and easily, mess free! Yamaha have provided a huge suite of apps that work in harmony with the MD-BT01 that include recorders, voice editors, piano diary, drum editors, sequencers and many more! Not only do you get wireless freedom, but a whole world of deep editing and creativity is opened up to you too. 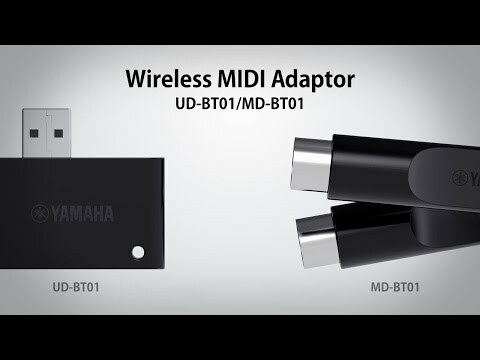 If you are the proud owner of any Yamaha digital piano, home keyboard or synth and need a quick and easy way to wirelessly connect to your Mac or iOS device, the Yamaha MD-BT01 Bluetooth Wireless Midi Interface is an absolute must. Posted on 22/04/2017 by Jono Rezzillo Works amazing with iPad Pro and iMac. I've used with loads of old and new MIDI products, used remotely for recording into Logic Pro X and iPad, all MIDI output devices so far work 100%.